British S10 Gas Mask with unopened screw on filter canister and camouflage respirator haversack - Army surplus in great condition. 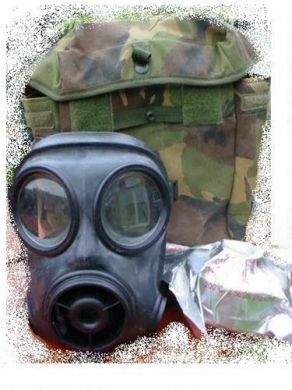 The S10 NBC Respirator is the protective gas mask currently in service with all branches of the British armed forces, and is generally accepted, along with its derivative, the FM12, as one of the best protective masks in the world today. The Avon S-10 gas mask was designed and developed for the British (MOD) and the British Special Air Service (SAS). Its advantages include improved levels of protection, communication, vision, comfort, compatibility and maintainability. Provides excellent protection against penetration by biological or chemical threat agents. Compatible with a wide range of user equipment including optical sights, weapons, combat clothing, protective head gear and communications equipment. Wearer comfort ensured by lightweight construction and low breathing resistance. Wide field of vision and good anti-misting characteristics. Intrinsically safe speech transmitter allows clear direct communication for excellent command and control. Secondary speech transmitter enables use of communications equipment. Fail-safe drinking system for use in contaminated environments. Left and right hand canister option. 6-point pre-adjusted quick fit harness allows rapid donning. Highly robust and easy to decontaminate. Currently in service with the British Armed Forces and numerous other military, paramilitary and police forces worldwide. For protection the S10 has a high-performance integrally molded reflex seal. The facepiece has a minimum of molding crevices which improves contamination efficiency. The facepiece is held on the head by a fixed buckle harness arrangement that allows the respirator to be repeatedly donned and removed in seconds. Primary communication is via a horn-type voice transmitter and there is also a secondary speech transmitter for use with communications equipment such as handsets, telephones and microphones. Vision is improved by the use of low profile coated polycarbonate lenses. A facepiece rib ensures a good interface with NBC protective clothing hoods. The drinking device has a double safety valve feature. The filter canister can be worn on either the left or right of the facepiece. The S10 can also be used with remote filtration units. Mask uses NATO 40mm filters.